Buckeye Flood Retarding Structures (FRS) Dam-Break & Inundation Analysis (AZ) | WEST Consultants, Inc.
WEST conducted a dam break and inundation analysis of the Flood Retarding Structure (FRS) series protecting the City of Buckeye and Interstate 10. The city is located between the White Tank Mountains to the north and the Gila River to the south. The FRS’s detain storm runoff and convey flows westward to the Hassayampa River. Each FRS has an emergency spillway which diverts flows greater than the design event south to the Gila River. The dam break analysis modeled flood scenarios characterizing the 6-hour Probable Maximum Flood (PMF) event and the Sunny Day event. The analysis provides information about potential consequences of the failure of an FRS structure. This information was used to improve the Emergency Action Plans for the various structures as well as to inform emergency management efforts. 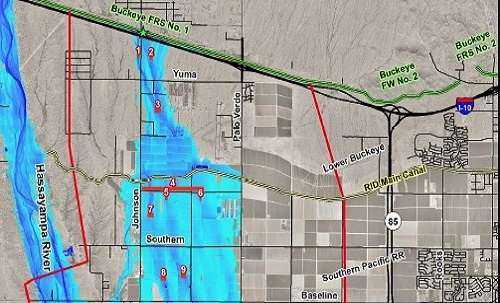 To carry out this analysis, WEST developed six large-scale FLO-2D models of the Buckeye FRS’s and the corresponding 135 square mile potential inundation area. WEST also developed a 20-mile long unsteady 1-D model of the FRS’s impoundment areas for the purpose of generating the potential dam break hydrographs. The hydrographs were used as inputs to the various FLO-2D models. The first model developed was a coarse grid (100-ft) FLO-2D model of the entire potential inundation area and was used to determine general flow patterns. Next, four fine grid (30-ft) FLO-2D models were developed to improve flood hazard mapping accuracy. Interflow between the models was accounted for during the simulations. These models were used to create inundations limits, isochrones of the arrival time of one-foot of water depth, and information at critical intersections. The sixth model covered the impoundment area of one FRS and was used to analyze dam break hydrograph differences between HEC-RAS and FLO-2D. WEST also performed a detailed literature review of flood hazard mapping and developed guidelines for categorizing flood hazards resulting from a dam break. These guidelines were used to map the flood hazards resulting from the various dam break locations along the Buckeye FRS’s.